Lord, we thank you for the blessings of this day and for this time together as family. Bless us as a family. Help us to grow in love and care for each other as we thank you for another day. Help us to show your love to others. The Walkathon was a great success last Friday with beautiful weather and outstanding organisation. My thanks to the P&F Co-ordinators and for parents and staff for their support. Mostly my thanks to our students who walked, skipped, ran and in some instances hopped around the oval to raise money for our school. It was a tremendous effort from all. Next week I’ll report on the wonderful efforts of the P&F with the Easter Egg Hampers. We are truly fortunate to have parents who help our community in such practical ways. My thanks to the many parents who have offered to contribute to the Evangelisation, Information Technology and Health and Wellbeing Learning Teams. If you believe you have a skillset that would contribute the parent voice to these important teams please let Mrs Ryan know, information can be sent explaining the purpose of the team and how you can help. If we have a large group of parents offering their services we will form parent reference groups to make sure you are all involved. 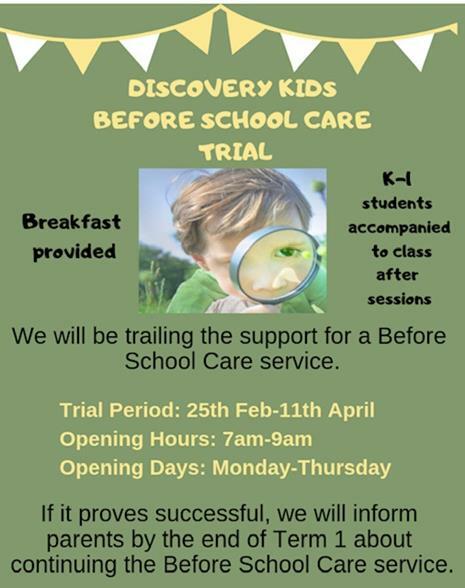 Please email admin@olg.cewa.edu.au or ring 6241 9500 for information. This week our school participated in a nationwide NAPLAN platform trial. This is in preparation for the NAPLAN Assessments being online this year. The test was for the national platform capacity not the school’s readiness. Mrs Hardwicke has been working with our IT provider, the Catholic Education Office and our staff to ensure that we will be ready next term. Parents of children in Year 3 and 5 would have received pamphlets and letters will be sent to parents next term with information about the timetable, the classroom procedures and a practice site. As always NAPLAN is one test at one point in time, it does not test all learning nor determine your child’s future success. More information next term. Each Monday in Lent we have met as a school to pray and to talk about an action for us to focus on during the week. Mrs Wandek has led us in highlighting ways we can be more prayerful, more generous and more conscious of our bountiful life during Lent. We continue out Lenten journey next Wednesday as we gather to walk The Stations of The Cross. This prayerful journey is an opportunity for us to pray with each other as we walk the story of Passion of Jesus. All families and Parishioners are very welcome to join classes throughout the day, times and information is available in the newsletter. This week's assembly is presented by the students in 2G. Parents of 2G children are invited to the staff room after assembly for a cup of tea or coffee with Miss Caitlin Manea. Congratulations to the students who received Merit Awards at last week's assembly. Cake Stall: The Year 3 classes will be holding a cake stall in the multi purpose area on Friday 5th April. Please come along and support their fundraiser. A reminder to the Year 3 parents who will be baking for the cake stall that OLG has a Nut Free policy. Thank you to those wonderful Mums, Bubs and toddlers who attended our Rhyme Time last Friday. Other than some IT blips, we had a great time! Please put 10th May 9:15 in your calendar for our next session. Hoping to see you all then. Bring your child, bring your friends. You don't need to be part of Our Lady of Grace School to enjoy connecting to your child through rhyme, story and songs. This year's Stations of the Cross will be presented by 6G. The Stations will be presented in three areas of the school. Beginning at the Amphitheatre, students will present and share with the congregation a prayer and time to reflect. The Stations will move to one more location before finishing in the church. There will be students there to guide and assist. Some chairs will be available at each location for those that require them. The presentation will last approximately 45 mins. Please have a look at the timetable and join us at any of the available sessions. As the term progresses I am becoming more aware that the tradition of 'camps' at OLG is having an impact on the education of our children. Strong family connections are made during these camps and there are many positive elements to them. However, students (and their siblings) are being taken out of class early on Fridays, sometimes not attending at all, and returning very tired on Mondays. This impacts your child's learning program in the class. Our Lady of Grace School does not sponsor, organise or have any organisational responsibility for parent camps. Under no circumstance is a parent camp to be booked using the school name. I would ask that if there are camps currently booked under the school name they are changed immediately. I led a discussion at the P&F about the impact of the camps and asked for feedback. The general consensus is that the camps are a great way for families to get to know each other and to build our Catholic community. If this is the case then consideration needs to be given to the financial affordability of camps and the impact on the education program at school. We have been given bags of wool and we need help knitting/crocheting squares and sewing them together for blankets. Please see Trish Sherlock in the Library if you can help out. Next week I'll be doing the Term 2 Roster. 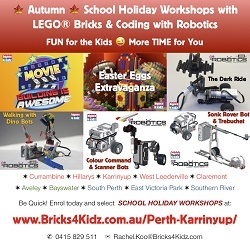 Please email (trish.sherlock@cewa.edu.ao) or see Trish in the Library if you haven't already handed in your forms. Uniform Shop: If you have received notification that your uniform order is ready to be collected can you please do so as soon as possible. A reminder for all parents to start checking your winter uniforms to ensure that they are ready to go for Term 2. The Uniform Shop will not be opened during the holidays. Alternatively you can place your child's order in the class canteen bucket. If your child's order does not go through and they have no lunch, we will supply them with a sandwich. We will no longer have additional items available due to food wastage costs. We have Gluten Free Bread, available for all sandwich fillings this year, toasted is also available. Any queries please feel free to come and see us. We thank you for your continued support of the canteen. Flexibuzz This is a whole school reminder for everyone to please tick the canteen box on FlexiBuzz for all future canteen related information, including updated rosters, roster swaps and reminders. This information will only be posted on FlexiBuzz, not on Facebook, so please tick the box and tell all your friends to do the same, otherwise you'll miss out. Thank you, Jemima and Peta. Want to share the values of Sunday morning mass with your children? Bring them along to Children's Liturgy in the Parish Hall every Sunday during the school term. The half hour session at the beginning of mass includes prayers and an activity to help the children better understand the mass. Nb: Liturgy is suitable for children 4 years and over. If you’d like to bring younger children you will have to stay and supervise them. The programme begins next term for all children preparing for First Eucharist. Please place the following dates in your diaries. Attendance at the following events is required if you wish your children to receive the Sacrament of Eucharist this year. Eucharist preparation begins in Term 2 with Faith formation for parents. Wine and cheese will be served from 6.30 with the meeting beginning at 7pm with Fr. Greg Donovan. This session is for parents only. Children and their families need to attend any ONE of the masses over this weekend. A BIG thank you to Carolyn Halleen & Linda D’Vaz for organising another successful walkathon. We also appreciate the volunteers who came along on the day to help with setting up, stamping cards, and supporting this P & F event. All the kids should be very proud of their efforts! 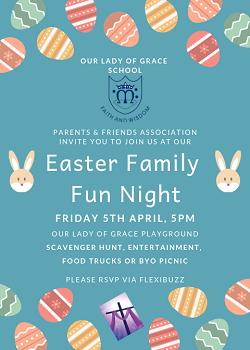 Come along and join in the fun this Friday 5th April from 5pm. There will be a scavenger hunt, entertainment and face painting. Food truck will be onsite, or bring your own picnic. Please RSVP on Flexibuzz so Amanda can gauge numbers for the Scavenger Hunt. 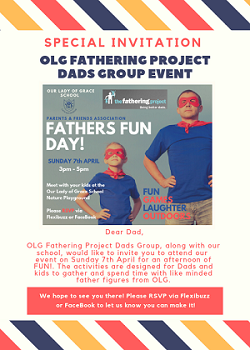 Hoping to see many dads, father figures and kids at our first Fathering Project event for the year - Fathers Fun Day this Sunday April 7th from 3-5pm at the OLG Nature Playground. Please RSVP via the event listing on our OLG P & F FaceBook page or on Flexibuzz. It’s that time again for our P & F sausage sizzle, so no need to pack school lunches if you’ve ordered a sausage sizzle for your kids. Please save the date and join us for our next P & F meeting commencing at 7.30pm on Wednesday 1st May in Discovery Kids room. This year, in an attempt to increase opportunities for parents to attend, the P&F meetings are scheduled for varying days of the week and time slots. The P&F Meetings will be held this year in the Discovery Kids Room. The season has gone so fast, last week was the last week of the regular season. This week is 1st week of finals or round robins games for some teams. Best of luck to all our teams competing this week! We are always looking for people to join the committee. Become a general committee member or just join us for one meeting, it’s a great way to see what committees are all about. 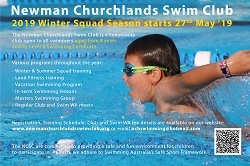 You will be amazed at how rewarding it is to be a part of the club and meet a great bunch of people. We will be looking for a new President for the new season. Please let me know if you’re interested in nominating. It was a fantastic event last year. This year is looking to be just as much fun. 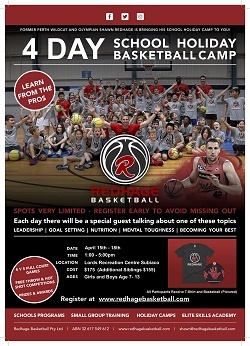 Players from the Stirling Senators will be coming to OLG to play some games and shoot some hoops with the OLG basketballers. 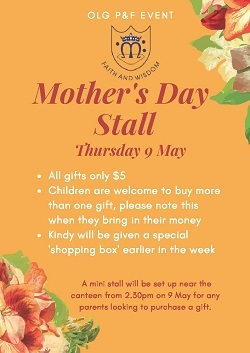 There will be a sausage sizzle and the very popular Mr Whippy will be there. Organise your team and get ready for a great afternoon to celebrate the season. AGM has been postponed a few weeks to allow end of season to be completed. Date is proposed to be in early term 2. Would love to have some feedback or ideas from members of how to improve the club. Please forward any agenda items. Come and support the Committee and see how the club is being run. We have extended sponsorship opportunities to OLG family and friends. Stay tuned for more exciting announcements soon. Please contact Tony Papotto or Trish Matusiak if you’re interested in joining other families in contributing to making OLG an even better school for our kids! Centre for Faith Enrichment: We endeavour to offer parents within OLG an opportunity for Adult Faith Formation. The attached documents outline the courses and events that are taking place throughout the Archdiocese in Term 1. Held over 3 evening of Mon 1st, Thurs 4th & Mon 8th April. 7-9pm. Please note – this course is also available 1:1 or In House by arrangement. We acknowledge the original custodians of this land, the Nyungar people, and show our respect for their ancestors and traditions.